Also serving communities of Eureka. To help you with your search, browse the 1 review below for assisted living facilities in Burlington. On average, consumers rate assisted living in Burlington 5.0 out of 5 stars. Caring.com has helped thousands of families find high-quality senior care. To speak with one of our Family Advisors about assisted living options and costs in Burlington, call (855) 863-8283. Burlington is a small city in Coffey County, which is home to a little over 8,000 residents, about one in five of whom are aged 65 and older. The city has a branch of the Coffey County Library, where seniors can participate in activities like Sewing Friends, Make&Take Craft and Book Discussion. In spite of its small size, Burlington has two assisted living facilities. These facilities are officially classified as adult care homes and are licensed by the Department of Aging and Disability Services. The Burlington area is home to world-class medical facilities, including Coffey County Hospital, in the event of medical emergencies or illness. Transportation services in Burlington are provided courtesy of Coffey County Transportation Incorporated, which has wheelchair-accessible vehicles and provides transportation to local shopping and dining venues, senior centers and medical buildings. Burlington seniors whose adjusted gross income is less than $75,000 do not pay state income tax on their Social Security income, and public pensions are not taxed at all, which may leave more money for assisted living expenses. However, other forms of retirement income, including withdrawals from retirement savings accounts and disbursements from private pensions, are fully taxable. Burlington is affordable with an overall cost of living that is about 23 percent below the national average and 13 percent below the state average. Seniors can expect to spend less on healthcare and transportation here than they would elsewhere in the state, though groceries and utilities tend to cost more. With property crime and violent crime rates that are considerably lower than the national average, Burlington may be a good option for safety-minded seniors. On a 100-point scale, with a lower score representing low crime, the city's violent crime rate is 11.1, a full 20 points lower than the national average, and the property crime rate is 28.6, about 10 points lower than the nationwide median. Summers in Burlington tend to be very warm with temperatures near 90 degrees, and winters are cold with lows near 20 degrees. The city gets just 9 inches of annual snowfall, versus the national average of 26, which may make winter errands easier for seniors who do their own driving. Assisted Living costs in Burlington start around $0 per month on average, while the nationwide average cost of assisted living is $4,000 per month, according to the latest figures from Genworth’s Cost of Care Survey. 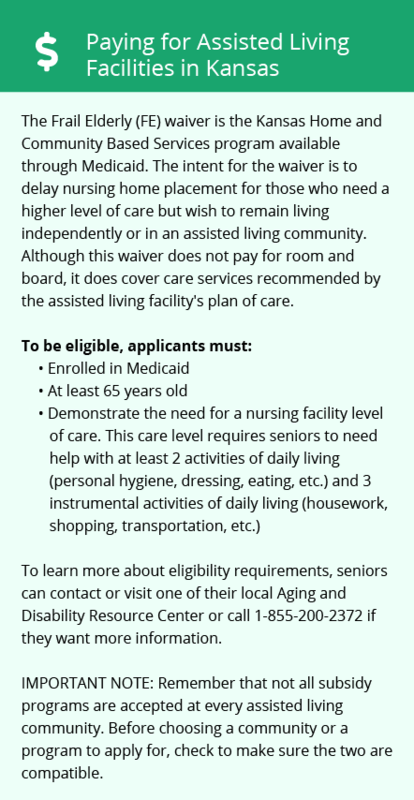 KanCare, which is Kansas' Medicaid State Plan, covers nursing services for low-income seniors residing in assisted living facilities in Burlington. Eligible applicants may also have assisted living services covered through the state's 1915(c) Home and Community-Based Services waivers. To see a list of free assisted living resources in Burlington, please visit our Assisted Living in Kansas page. Burlington-area assisted living communities must adhere to the comprehensive set of state laws and regulations that all assisted living communities in Kansas are required to follow. 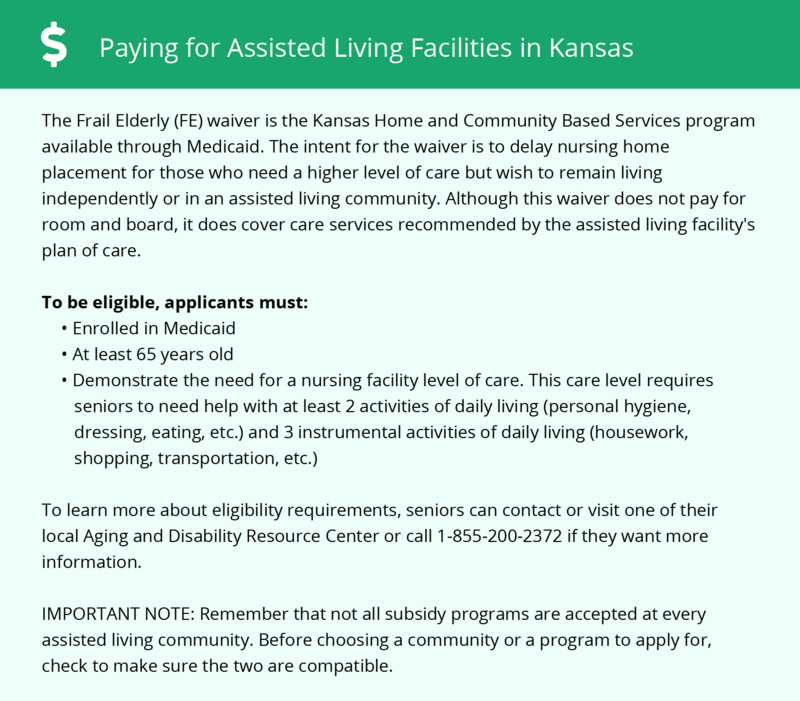 Visit our Assisted Living in Kansas page for more information about these laws.